← The 2017 Claims Education Conference heads to New Orleans! In Case You Missed It….We Give You The Summer Issue of Claims Education Magazine – IT’S FREE! 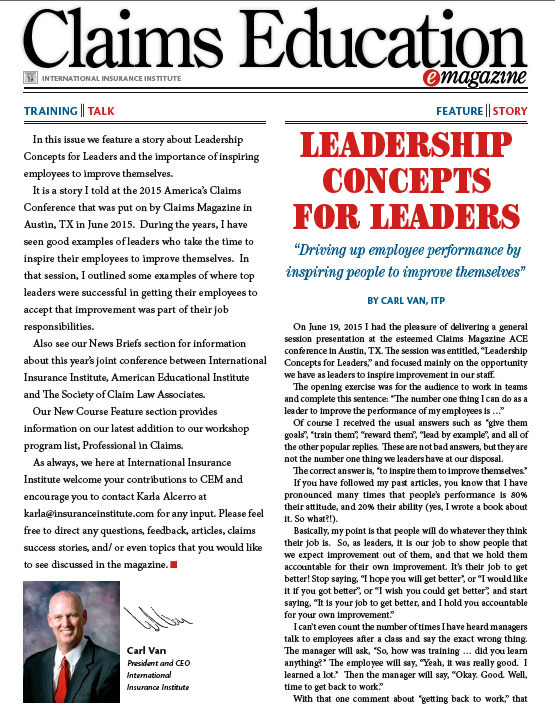 Claims Education Magazine® is wholly owned and published by International Insurance Institute, Inc. Since our first publication of Claims Education Magazine® in 2005, we have grown to over 37,000 recipients. For all 37,000 subscribers, an e-mail announcement is sent directly to them, letting them know the current and prior editions can be viewed online at this website (www.ClaimsEducationMagazine.com). Downloading any full issue or any part of Claims Education Magazine is free at all times. There is also a link on this web site where anyone who requests it can receive the printed version of the Claims Education Magazine. For editorial questions or contributions, contact Karla Alcerro at Karla@InsuranceInstitute.com. For advertising, contact Carl Van at carlvan@insuranceinstitute.com. A special thanks to all of our customers who helped to make Claims Education Magazine so successful. Carl Van, President & CEO of International Insurance Institute, Inc., graduated from California State University, Sacramento where he received his bachelor’s degree in Insurance. He has been in the insurance claims industry since 1980 and has held the positions of Claims Adjuster, Claims Supervisor, Claims Manager, Division Claims Manager and Regional Manager over Claims, Loss Control and Premium Audit. Mr. Van has set up 5 in-house claims training programs for various insurance companies throughout the United States, and has written articles for Claims magazine, Claims Education Magazine, Claims Advisor, Claims People magazine, The Subrogator, The National Underwriter, California Insurance Journal and over 100 other national magazines. He is the author of over 75 technical and soft skill workshops being taught throughout the U.S., Canada and the U.K. He has been a keynote speaker at claims conferences around the country, a trainer at an international U.S-Japanese executive training program, a guest speaker at hundreds of claims association seminars, and selected as the opening presenter at some of the most prestigious claims conferences in the United States and Canada. Mr. Van is the Dean of the School of Claims Performance, and has served as both board member and Regional Vice President of the Society of Insurance Trainers and Educators. He is owner and publisher of Claims Education Magazine, and board president of both the Claims Education Conference and the International Claims Executive Academy. Mr. Van is creator, presenter and producer of all claims training videos at Claims Education On Line, which include Time Management, Customer Service, Negotiations and Critical Thinking, all specific to claims professionals. He owner and publisher of Claims Professional Books On Line, and is the author of the highly acclaimed book The 8 Characteristics of the Awesome Adjuster, which has sold internationally throughout the United States, Canada, Newfoundland, Guam, Singapore, France, Australia, England, Chile, Ireland, and 15 other countries. Other books by Carl Van include Gaining Cooperation, The Claims Cookbook, and Attitude, Ability and the 80/20 Rule. Other credits include being an arbitrator, a licensed agent, a TASA certified expert witness for insurance Bad Faith suits, as well as a national auditor for a federal regulatory agency. Posted on September 27, 2016, in Uncategorized and tagged 8 Characteristics of the Awesome Claims Adjuster, Adjuster Articles, Characteristics Claims Coaching, Claims Education, Customer Service, Publications. Bookmark the permalink. Leave a comment. Never Miss a Post Again. Get Updates Sent Straight to Your E-mail!